When Section 9 monitors a cyborg’s brain for real-time evidence of hacking, we see a monitoring scan. 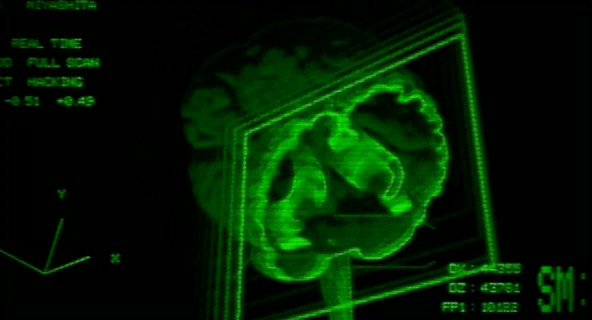 It shows a screen-green wireframe brain floating at an oblique angle in a black space. A 2D rectangle repeatedly builds it with a “wipe” from front to back, which leaves a dim 3D trail in its passing that describes the brain shape. Fans of the National Library of Medicine’s The Visible Human Project may see similarities, though the project’s visualizations would not be available until a year after the film’s release. In the upper left is a legend reading, “REAL TIME FULL SCAN HACKING” with some numbers, with another unintelligible legend in the lower right. The values in the upper left never change, and the values in the lower legend change too rapidly to read them. After a beat, a text overlay appears on the right hand side of the screen with vaguely-medical terms listed in all capital letters, flying by too quickly to read*. There is an additional device seen in the corner of the frame, with progress-bar-like displays with thick green lines that wobble left and right. Two waveforms hang above this, their labels off screen. 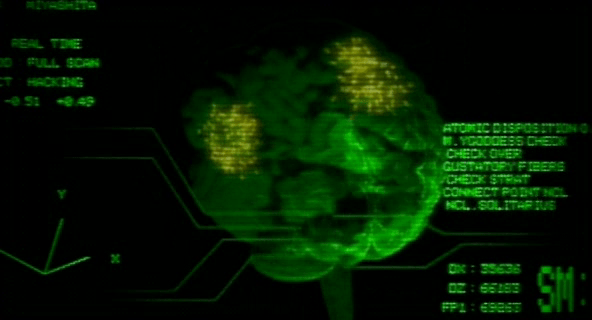 Yellow “fireworks” appear near the “temples” of the brain, indicating the parts under attack. If data doesn’t change or changes too fast to read, it is worth asking if the data should be shown at all. If it’s moving too fast, other representations might work better, like a progress bar, a map, or sparkline. Of course, we know that many programmers may use this kind of output during the run of a program so that if the program stops, the last few activities may be immediately known, so this may be more code than interface. If you’re the sort of nerd who obsesses over details, following is the text that flashes on the right hand side of the display. There’s nothing in it that is really helpful or informative to a review. It’s mostly internal organs or parts of the brain augmented with “CHECKS” and “CONNECTS”. There’s one exception, about halfway through the 5-second sequence, where it reads “M.YGODDESS CHECK.” Diegetically, it could be a programmers slang for a body part. More likely it’s a reference to Oh! My Goddess!, a manga by Kosuke Fujishima that’s been in print since 1988. Aboard the Fhloston Paradise luxury liner, we are treated to a quick view of the ship’s wheel. The helmsman stands before the wheel, in the middle of a ceiling-mounted translucent yellow cylinder that drops just below shoulder level. This surface acts as heads-up display that is visible only from the inside. The content of the display is a 3-D, featureless, blue graticule with an overlay featuring target brackets, various numeric data strangely labeled with various numbers of “m”s and “n”s, and a green, faint outline of a railing, as if the helmsman was looking out from a Lawnmower Man interpretation of an Age of Sail wheelbridge. At the top of the display are three yellow-outline rectangles with no content. In the center-top of his view is a compass readout, with a rolling counter display that appears to show bearing. In practice, the Captain calmly gives an order to a barker, who confirms with a, “Yes, sir” before walking to the edge of the cylinder and shouting the same order, “HELM ONE OH EIGHT!” To confirm that he heard the message, the helmsman repeats the order back and turns the wheel. The helmsman wears a headset that amplifies his spoken confirmation back to everyone on the bridge. The Captain doesn’t want to shout or wear a headset. He’s a gentleman. But if the helmsman is going to be trapped in the yellow cone of silence, there must be an intermediary to convey the commands and ensure that they’re carried out. Even if technology could solve it better, I have the sense that navies are places where traditions are carried on for the sake of tradition, so the human aspect of this interaction doesn’t bother me too much. It does add a layer of intermediation where data can go wrong, but the barker and the helmsman each repeat the command loudly, so the Captain can hear and error-check that way. On the plus side, showing the graticule grants a sense of speed and (kind-of) bearing that would be much more difficult to do on the surface on all-water planet like Fhloston Paradise. So that’s nice. But that information would be even more useful if it was backed up by some other contextual information like the clouds, the position of the sun, or, say, anything else on the surface of the planet toward which they might be barreling. A simple highly-transparent live feed of a camera from somewhere would have been more useful. And of course I can’t let the silly nonsense data on the edges just go. Shipmen love their sea-salted jargon, but they also love effectiveness, and there is no sense to labeling one variable “nm” and the next “nmn,” much less a whole screen of them. They would be difficult to distinguish at the very least. Certainly there’s no use to having two variables labeled just “m” with no other contextualizers. Even if it was better labeled, presenting this information as an undifferentiated wall of data isn’t helpful. Better would be to turn some of these into differentiable graphics that help the helmsman see the information and not have to read it. In any case, the arbitrary blinking on and off of data just needs to stop. It’s a pointless distraction unless there is some monitoring data that is trending poorly and needs attention. Finally, if you obsess over editing details (and you are reading this blog…) you’ll note that the bearing indicator at the top begins to change before the helmsman moves the wheel. It even moves before the helmsman repeats the order. It even begins before the the barker shouts the orders. (Reminiscent of the chem department flub from Cabin I covered earlier.) It looks like the HUD designers wanted movement and mistimed it before the events in the scene. But we don’t have to leave it there. We’ve already noted that seamen love standing on tradition. What if this whole interface was vestigial? If the ship has a low-level AI that listens to the captain, it wouldn’t need to wait for any of the subsequent human processes: the barker, the helmsman repeat, or the wheel turning. Each of these acts to confirm the command, but the ship can go from the first order when it has a high degree of confidence. This would also excuse the nmnmmnonsense we see on the HUD. The display might have degraded to displaying noise, but no one needs to fix it because the ship runs just fine without it. Thinking that the Fhloston Paradise might have been a bioship only makes its destruction from a Zorg Mangalore Zorg bomb only makes its destruction much more tragic, but also more heroic as it died saving the people it had been programmed to serve all along. To learn the plans of the President, Zorg’s flunky named Right Arm infiltrates the briefing room via a remote-controlled cockroach. This adorable insect has a small parabolic receiver antenna on its back. Right Arm can watch what it sees with its eyes and listen to what it can hear through its… cerci? The screen he uses is mostly full of the roachcam video. But it is unfortunately surrounded by some screen-green sciencey nonsense. A row across the top is headed “001” with rectangles labeled “MOVE”, “METHOD”, “CHECK”, and “SYSTEM.” A row just below is headed “A-B” with rectangles labeled “SPEED”, “TIMER”, “EXIT”, and “FILTERS.” A column of screen-green nonsense shapes fills the left side. A small butterfly-shaped graph at the bottom-left is labeled “CHECK.” A small box labeled “CALCULATING” is in the lower middle, which occasionally fills with scrolling nonsense. The right side of the screen is full of a circular graph showing a seizure-inducing flashing pair of green concentric circles. A green 8×8 grid on the right stays empty the whole time, though it is arguably the most likely useful thing, i.e. an overhead view of threats, say, like presidents brandishing cockroach-smashing shoes. Below the unused grid is a diagram of the roach itself, probably useful for understanding the health of the vehicle. Below that is a bit of unintelligible text reversed out of a gray background. When the roach nears the President, a bit of green nonsense text appears overlaid on the video feed, though it never changes. I think this screen would have been less distracting and more helpful for Right Arm if you stripped away all the gunk at the top, the nonsensical overlay, trashed the column of hastily-drawn icons, saved him the constant distraction of the seizure circle by removing it, and leaving him with the two things that would actually be useful: the map (populated of course with some useful information), and the roach health diagram. Even though this screen is seen only for a few seconds at most, it reads as if it was hastily put together, unlike most other things seen in the film. He is able to control the roach’s movement by means of a joystick with a rotating head. In contrast to the screen, this provides exactly what Right Arm needs to control the roach, and no more. He can move it forward and back by pushing the joystick forward and back. He can have it strafe right or left by moving the joystick appropriately. And when he wants to have it turn right or left, he can twist the joystick head in that direction. Pushing or twisting farther results in more motion. All told, a perfect input control for the task at hand. At least until you ask the roach. The scientist Mactilburgh reconstructs Leeloo from a bit of her remains in his “nucleolab.” We see a few interfaces here. We never see Mactilburgh interact with the controls on this display: Potentiometers, dials with circular LED readout rings, glowing toggle buttons, and unlit buttons labeled “OFF” and “ESC.” There’s not much to grasp onto for analysis. These are just “sciencey” set of physical controls. The display is a bit of similar scienciness, meant to vaguely convey that Leeloo is a higher-order being, but beyond that, incomprehensible. Interestingly, the Mondoshawan DNA shows not just a more detailed graphic, but adds color to convey an additional level of complexity. An odd bit: In the lower right hand corner of the screen you can see the words “FAMILIAL HYPERCHOL TEROLEMIA.” Looking up this term reveals the genetic condition Familial Hypercholesterolemia. It’s only missing the “ES.” What’s this label doing here? This could be the area on the DNA chain where the markers appear for this predisposition to high cholesterol, but wouldn’t you expect that to take up 5000 times less room on a DNA strand of a perfect being, not the same percentage? Also it kind of takes the winds out of the sails of Mactilburgh’s breathless claim that she’s perfect. Anyway it’s a warning lesson for sci-fi interface designers: Watch where you pull your sciencey words from. If it’s a real thing, ask whether the meaning runs counter to your purposes or not. The first bit of human technology we see belongs to the Federation of Territories, as a spaceship engages the planet-sized object that is the Ultimate Evil. The interfaces are the screen-based systems that bridge crew use to scan the object and report back to General Staedert so he can make tactical decisions. An analog, underlit, grease-pencil plotting board. The operator of the first of these screens touches one of the pushbuttons to no results. He then scrolls the trackball downward, which scrolls the green text in the middle-left part of the screen as the graphics in the main section resolve from wireframes to photographic renderings of three stars, three planets, and the evil planet in the foreground, in blue. The main challenge with the system is what the heck is being visualized? Professor Pacoli says in the beginning of the film that, “When the three planets are in eclipse, the black hole, like a door, is open.” This must refer to an unusual, trinary star system. But if that’s the case, the perspective is all wrong on screen. Plus, the main sphere in the foreground is the evil planet, but it is resolved to a blue-tinted circle before the evil planet actually appears. So is it a measure of gravity and event horizons of the “black hole?” Then why are the others photo-real? Where is the big red gas giant planet that the ship is currently orbiting? And where is the ship? As we know from racing game interfaces and first-person shooters, having an avatar representation of yourself is useful for orientation, and that’s missing. And finally, why does the operator need to memorize what “Code 487” is? That places a burden on his memory that would be better used for other, more human-value things. This is something of a throw-away interface, meant only to show the high-tech nature of the Federated Territories and for an alternate view for the movie’s editor to show, but even still it presents a lot of problems.